In a location where competition amongst restaurants is fierce, the people behind 10 Greek Street (previously from the Wapping Project) have bravely decided to launch their Soho restaurant with a pared-down approach. Far from being overtly chic or stylised, the restaurant’s laid back stance means that there are no table cloths, that bistro menu is listed on the blackboards, and diners are required to pick up their own cutlery from each of the cutlery holders stationed on the tables. But the casual look of the restaurant feels perfectly nice. Its philosophy seems to be that it should be more about the food, a philosophy which I like. We started with a soup of sweet potato, farrow, wild garlic and pecorino (£5). I had expected a strong aromatic flavour coming through from the garlic, but what we got instead was something rather bland, healthy tasting, but bland. 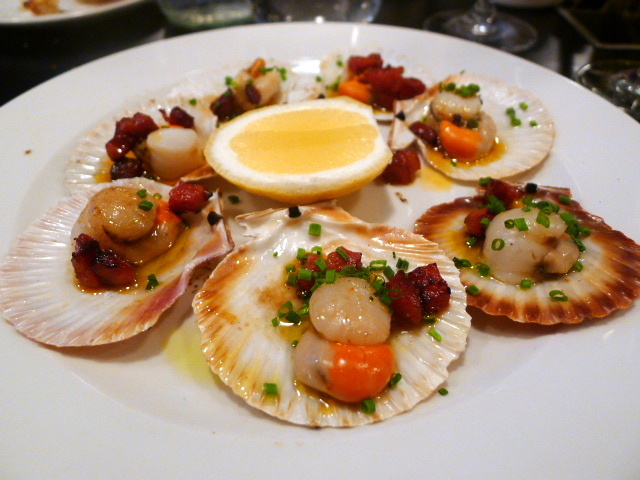 The choice to serve queen scallops with chorizo (£8) was probably quite brave, but these scallops were incredibly tiny. There was no browning/caramelisation effect on the scallops. As the scallops were quite soft, the lack of caramelisation meant they ended up tasting squidgy. The chorizo was the magic element in this dish and was what helped to lift it. A dish of grilled fillet of stone bass was stunningly good. The cooking wasn’t quite flawless – a small portion of the skin was ever so slightly burnt, and a little bit of its centre was undercooked. But it was amazingly fresh and moist, and its meaty flesh packed in so much flavour that this was something you would probably wish to have again and again. 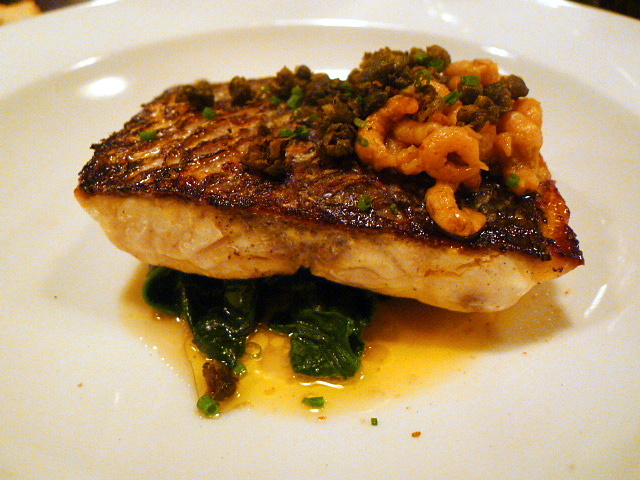 The accompanying spinach finished in butter, brown shrimps and capers matched the fish perfectly. A native lobster (£12.50 for a starter, £25 for a main) was meaty, tasty and fresh. 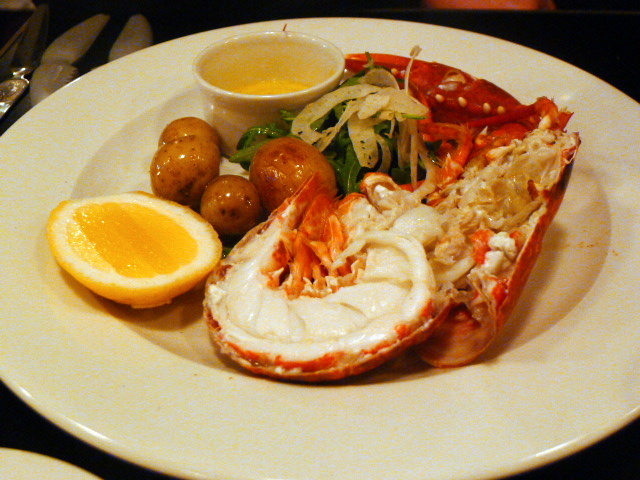 The accompanying saffron mayo was delectable and worked well with the lobster, as did the new potatoes. Good, but simple, although I would have preferred it cooked to order rather than being precooked and served cold. 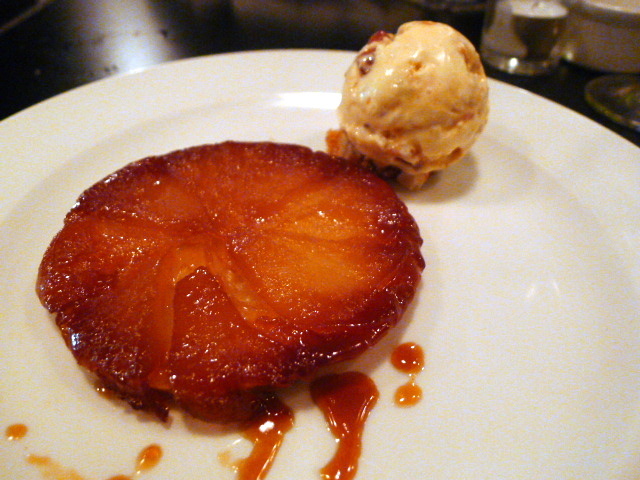 A dessert of pear tatin (£4) was lacklustre. The pear was nicely cooked, but the pastry was limp rather than flaky. There was also a slightly bitterness in the praline that made up the side of almond praline ice cream. This restaurant has been receiving rave reviews from critics and bloggers alike, and with dishes as stunningly good as the stone bass, it’s easy to see why. On this dish alone, I was convinced of the potential brilliance of 10 Greek Street. 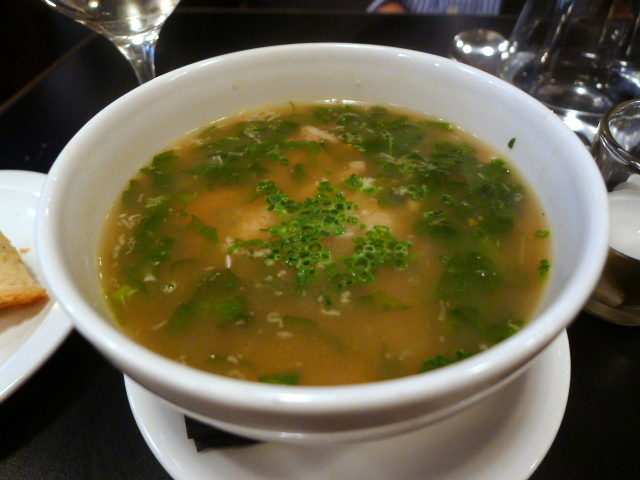 But there were some mediocre aspects to the food as well which left me questioning the level of consistency at the restaurant. This and the significant delay between our starters and mains meant that the kitchen also had some timing issues. There were also other shortcomings. As nice as it is to see a restaurant with a no-frills approach to its décor, this simplicity has left the dining room with little soundproofing. At times the noise levels were so loud it was like thunder in my ears. And the ventilation over the open kitchen was poor, leading to smoke permeating the dining room. And as seems to be the annoying norm nowadays, the restaurant also has a no reservations policy in the evenings. Yes, bloggers and critics seem to love this place, but I found the experience of eating at 10 Greek Street quite trying. If every dish had hit its mark, I could have overlooked all of them, but on balance there wasn’t enough to make me consider it to be a ‘destination’ restaurant. Prices are reasonable and the fish was so stunning that I am prepared to try 10 Greek Street again, but perhaps during a lunchtime when it’s less likely to be so busy. Price range: £22 – £45 for three courses. Excludes drinks and service. Aah yours is first review I’ve read to mention that noise issue and I’m grateful… I find venues with high noise levels difficult too and it does impact on the experience. It’s definitely the downside of a lack of soft furnishings; the noise just bounces and reverberates around the room. Re the bookings policy of this & many other restaurants: they’re damned if they do and damned if they don’t. People complain if they’re offered a 7pm table and requested to give the table up at 9pm. People complain if they can’t book and have to queue. A restaurant has to maximise tables in order to survive. Suggestions anyone?? Like you, I didn’t really read any mentions of the noise and I agree it was due to the lack of soft furnishings, ie, the low key approach to decorating. But I think noise levels are very important as it can affect your overall dining experience. I take your point. But as a diner, I find it annoying to not be able to book. I’m not sure what the solution is. This table reservation business is interesting – an easy to grasp example of the costs of uncertainty, the bane and the lifeblood of the market. I think this chronic uncertainty is an enormous difficulty in most people’s lives. But I digress. The food sounds lovely.